The text under the picture of the TV says, "Progressive research, like that which gave us the Graphechon tube, accounts for the superiority of RCA Victor's new 1950 home television receivers." Ever heard of the revolutionary Graphechon Tube, by RCA? Neither had I, until I saw it mentioned in an ad for RCA televisions in a 1950 edition of The Saturday Evening Post. My curiosity was piqued enough to do some research. 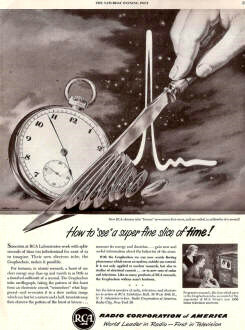 "Scientists at RCA Laboratories work with split-seconds of time too infinitesimal for most of us to imagine. Their new electron tube, the Graphechon, makes it possible. For instance, in atomic research, a burst of nuclear energy may flare up and vanish in as little as a hundred-millionth of a second. The Graphechon tube oscillograph, taking the pattern of this burst from an electronic circuit, "remembers" what happened - and re-creates it in a slow motion image which can last for a minute and a half. Scientists may then observe the pattern of the burst at leisure... measure its energy and duration... gain new and useful information about the behavior of the atom. With the Graphechon we can now watch fleeting phenomena which occur at random, outside our control. It not only applied to nuclear research, but also to studies of electric current... or in new uses of radar and television. Like so many products of RCA research, the Graphechon widens man's horizons." "(graf′ eh kän) A storage tube having two electron guns, one for writing and the other for reading and simultaneous erasing, on opposite sides of the storage medium, which consists of an insulator or semiconductor deposited on a thin substratum of metal supported by a fine mesh." Here is a photo of an actual Graphechon Tube, on the LampsEtTubes.info website. Look at the bottom of the page. "The GRAPHECHON is a charge storage tube intended for data-processing applications where signal information must be transformed continuously from one time base to another. Both guns have electrostatic focus and utilize magnetic deflection. Total length : 47.8 cm (18.80 in)."